Leaked top secret data of French shipbuilder Direction des Constructions Navales Services (DCNS) specifying the top-secret combat capabilities of the Indian Navy’s Scorpene-class (Kalvari-class) diesel-electric attack submarine also include sensitive details on the Exocet SM39 anti-ship missile expected to be deployed on the new subs, The Australian revealed in its latest report. “The data includes the number of targets the missile is capable of processing, its launch details and how many targets could be downloaded before firing,” the report states. The Exocet is a French-made sea-skimming, subsonic, solid-fueled anti-ship missile with an estimated operational range of 50 kilometers. It has been designed to attack small- to medium-size surface warships. The missile is launched from a torpedo tube in a water-tight launched capsule. According to the missile maker’s website, “the aerial missile is ejected as soon as it breaks the surface, to ensure a very low culmination altitude. It then rapidly homes into the target at sea skimming level: it uses an inertial navigation system followed by autonomous terminal guidance from an active RF seeker.” Next to the Exocet missiles, the Scorpene-class’ six 533 mm bow located torpedo tubes are compatible with F17, BlackShark, and Mk48 torpedoes. Despite the Exocet leak, the Indian Nay will likely not be looking for an alternative to the missile anytime soon. For one thing, Pakistan is operating the same type of missile and would be privy to much of the information leaked in the documents. Also, the one thing that would compromise the sub’s combat capabilities—the source code of the Scorpene-class’ fire control system—has apparently not been leaked. “Just the generic technical specifications are little indication of a submarine’s operational capability. The element of stealth and superiority is how a navy operates its submarines with the equipment on board and therein lie the vital elements of secrecy essential for submarine operations,” a retired Indian naval officer who was associated with the Scorpene-class project for the Indian Navy told The Indian Express. The leak comes at a critical time when Australia and France are working on the details of the deal including construction schedules and technology transfer agreements. DCNS said (…) that the leak could have been executed by one of the two frustrated competitors in the bid, Mitsubishi Heavy Industries (MHI)/ Kawasaki Shipbuilding Corporation (KSC), and the German company ThyssenKrupp AG (TKMS). 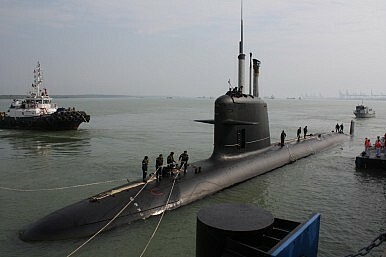 India awarded a $4.16 billion contract (known as Project 75) to DCNS for the construction of six Scorpene-class submarines (with an option to build six more) with the support of India’s state-run Mazgaon Docks Limited (MDL) . The Scorpene-class submarine program has faced repeated delays over the last couple of years (See: “India’s Submarine Fleet Faces Further Delays”).